I read this about 10 days ago. I continue to think about it. Eric Dorman, “Of Cubs and Humans and Good Thieves,” Mockingbird (July 30, 2018) [link]. It reminds me of “If you’re automatically sure that you know what reality is, and you are operating on your default setting, then you, like me, probably won’t consider possibilities that aren’t annoying and miserable.” David Foster Wallace, “This is Water,” available many places on the Web, including [link] and [audio link]. There i s no safe investment. To love at all is to be vulnerable. Love anything, and your heart will certainly be wrung and possibly be broken. If you want to make sure of keeping it intact, you must give your heart to no one, not even to an animal. Wrap it carefully round with hobbies and little luxuries; avoid all entanglements; lock it up safe in the casket or coffin of your selfishness. But in that casket — safe, dark, motionless, airless — it will change. It will not be broken; it will become unbreakable, impenetrable, irredeemable. The alternative to tragedy, or at least to the risk of tragedy, is damnation. The only place outside Heaven where you can be perfectly safe from all the dangers and perturbations of love is Hell. C.S. 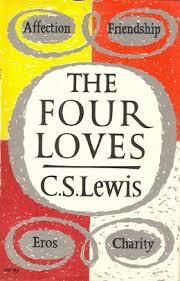 Lewis, The Four Loves 121-122 (1960).